"A colorful summer salad with great flavor. 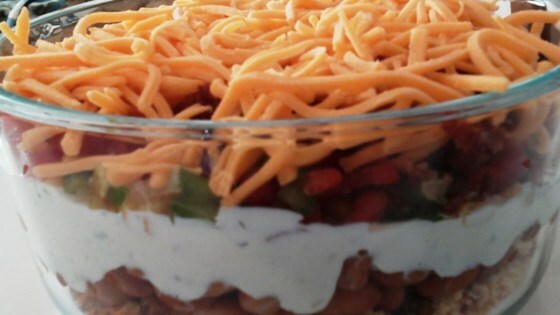 Whenever I share this dish at a potluck, I am always asked for the recipe." it was okay fro me...expected more flavor i guess... everyone else liked it okay... it wasn't bad but it wasnt great..wont make it again. fun, colorful, and delicious yet unique. i take this salad to just about every outing i go to. one woman stood by my pan until i claimed it just so she could get the recipe.